The Synthasystem Frequency Divider is a rather unique and interesting module. It produces four user-selectable divisions of an input signal and sends them to a mixer with level controls for each division, and a master level control. 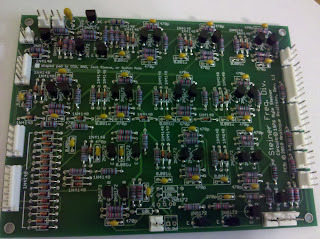 Each divider outputs a square wave, so you could use it for audio and CV signals, creating suboctaves, staircases, etc. And it will work as a clock divider too, with alternate inputs and outputs for S-Triggers. This sort of module was pretty rare for modulars in the 1970s. In fact, as far as I can tell, the only other manufacturer to come close was Polyfusion, with their model 2090 Octave Divider. I don't know much about the 2090, but I've seen a schematic and it is based around the 4024 ripple counter, and has seven fixed division outputs; I'm not even sure if it was intended more for CV or audio. There was also a frequency divider from Blacet, but I'm not sure what features were on the original (or even what it looked like). John Blacet had an article describing a simple 4024-based frequency divider in Vol. 1 Issue 3 of Synapse in 1976; I'm guessing his own was an expanded version, and perhaps only available as a kit. Other than those, I am not aware of anything from the 1970s (Moog, Buchla, Aries, ARP, E-μ, Serge, etc.) that did any sort of clock divisions or suboctaves (besides using a sequential switch for basic clock divisions). Yeah, that's a lot of parts! 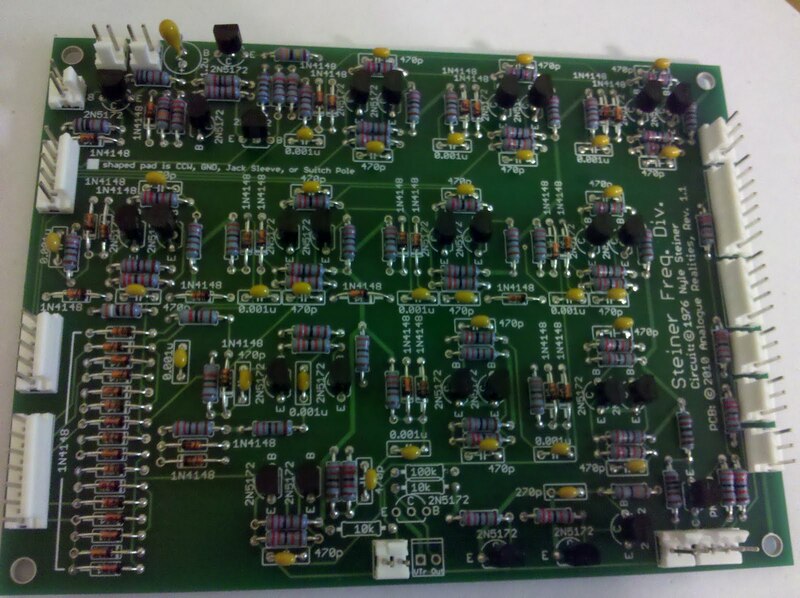 No CMOS here, just a ton of transistors and diodes. I've omitted three resistors and a transistor at the bottom center - they're for the the S-Trig to V-Trig converter on the output, and I've omitted it for the same reason discussed previously regarding the Peak Selector (i.e. to keep the output floating when off). I'm holding off on ordering the panels until I get a couple of Alpha rotary switches from Mouser. I'd like something a bit different from the Electroswitch ones, so I want to check these out before I get the panel made.